Halex Conduit Locknut, 1/2 in Nominal, Steel, Zinc Plated, CSA Certified, UL Listed, For use to secure rigid, imc conduit or various threaded fittings to a steel outlet box or other metal enclosure, indoor/outdoor Secures rigid or IMC conduit, or threaded fittings to steel outlet boxes or other steel boxes where moisture proofing is needed. Steel with zinc plating, pre-molded seal on one side. Zinc die cast. Rounded surface prevents damage to insulation. Thermoplastic liner rated at 150 degree F. Indoor or outdoor use. 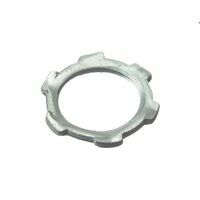 Use with locknut to terminate service conduit to a cabinet. Lug provided for bonding jumper to a neutral bus bar. UL Listed, CSA Approved.